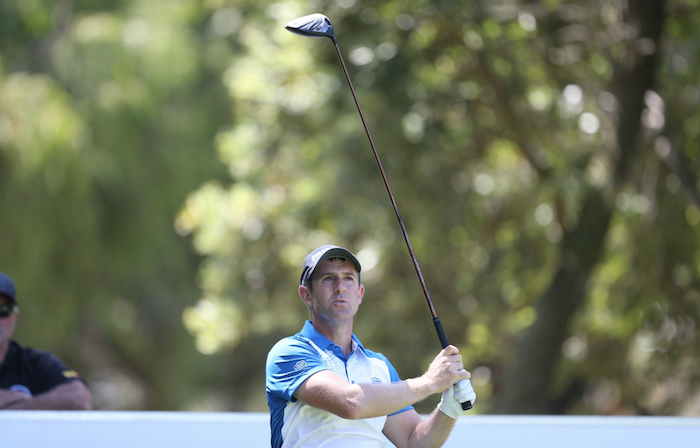 Peter Karmis backed up his opening 63 with a flawless 66 at the Cape Town Open as he heads into the weekend two clear of his nearest challenger. Karmis, a runner-up at last season’s event, which was held at King David Mowbray due to the water challenges faced at Royal Cape, opened his second round with back-to-back birdies to set the tone. Those were followed by another birdie on the fifth after he’d picked up pars on the third and fourth holes respectively. He held things steady on the final four holes of his front nine, making three straight pars before making further gains on the ninth to turn in 32. ‘Today was a lot more difficult than yesterday,’ Karmis noted after his round. He managed himself well, however, despite the wind, and after the two pars he made on the 10th and 11th holes, played the 12th expertly to pick up a birdie there. He did not make another birdie until the last hole and was happy to take home a blemish-free 66. ‘I’m very pleased,’ he said. Taking up the second spot was Andrew Curlewis, whose second-round 64 took his total for the week to 13-under par and two shots off Karmis’ lead. The third position on the leaderboard is occupied by veteran Adilson da Silva, who carded the lowest score of the round, a 63, to total 10-under par. He shares that spot with overnight leader Strydom, and Thriston Lawrence. Hennie Otto, England’s Richard Bland, Zander Lombard and Justin Walters share the sixth spot on nine-under par for the week at Royal Cape.